We have a security CCTV system network at the factory all the cameras feed video signals back to the server to record onto the harddisk for archive purposes. One day the recording software crashed as the images on the master monitor (where you can view all the camera feeds on a single screen) froze. As I went to reset the server and I found out what caused the crash. 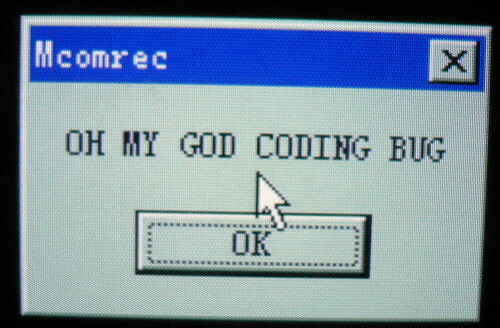 It was the "Oh My God" coding bug. Mann... these SpitLand software programmers have a strange sense of humour. LOL. lol.. any thought of sending the bug back as "smlj coding bug"?? Gary: Well, it will take a programmer to hide an easter egg like that. Unfortunately, I don't have the coding know-how to pull something like this.